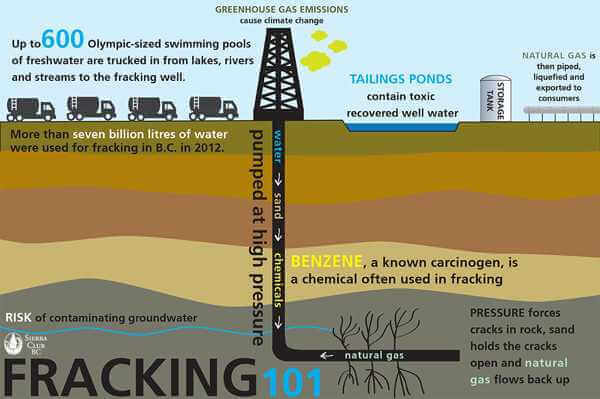 Fracking. We’ve heard the term, but do we know what it means? Fracking is short for hydraulic fracturing. It’s a method of extracting natural gas and oil from shale deposits deep within the earth. Water, chemicals, and sand are pumped into these shale deposits under very high pressure which causes the shale to fracture, releasing the natural gas and oil trapped within. The slurry of water, chemicals, gas, and oil are then slowly pumped back out, leaving the sand to hold the fractures open so the mixture can be removed. As the slurry of chemicals, water, sand, gas and oil is pumped back out of the ground, it is separated into its different components and stored in tanks. And it’s the removal process where the problems lie for our groundwater. It’s been estimated that anywhere between 20 and 40 percent of the chemicals are left behind. They can then seep into the groundwater, contaminating wells and rendering the water undrinkable. Who hasn’t seen the pictures of people lighting their tap water on fire? Benzene is one of the chemical components of the chemical cocktail pumped into the ground. It’s a byproduct of petroleum production and a Class A carcinogen. Benzene exposure has long been known to cause various forms of leukemia. Benzene exposure to eyes or skin can cause irritation. Drinking benzene in you water causes stomach irritation, vomiting, convulsions, rapid heartbeat and even death. Have you ever imagined lighting the water coming out of your household faucet on fire? If so, you might as well be asking the question “Should I have my water tested for poison?” Private Lab Results can test for fracking chemicals… Do not wait for you or a loved one to become sick. If you live near where fracking is taking place, your water should be tested for poison, toxins and herbicides.